Red Gate Farm, LLC - What is "Forest Pork?" The term "Forest Pork" came about after we raised our first hogs at Red Gate Farm, and they were living in a forest setting that whole time. After a tremendous amount of research into modern and popular ways of raising hogs, we found ourselves drawn to the old-fashioned paradigm of turning hogs out to forage, root, plow, and otherwise do what comes naturally in a woodland setting. You won't find painful rings in our hogs' noses! 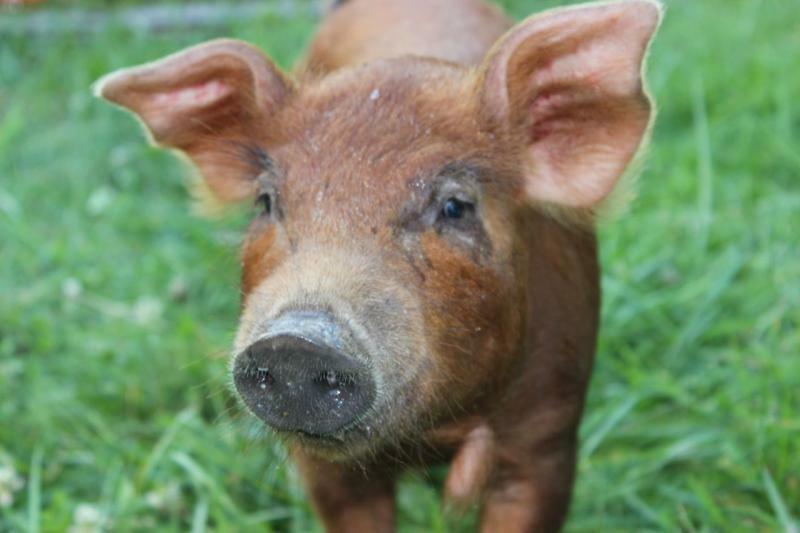 We raise purebred Red Wattle hogs, which are considered a "heritage" breed. This means they carry older, more traditional genetics than modern, conventional, industry-raised hogs. Although they grow a bit slower than commercial hybrid hogs, they thrive in a natural setting. Since hogs are designed to be omnivores, much like people, we do not limit them to a vegetarian diet. Rather, they recieve a balanced diet, based on their natural instincts and omnivorous requirements. Previously we farrowed our own sows in the woods, but we have temporarily suspended our breeding program in order to improve our farrowing shelters and paddocks. In the meantime, we purchase weaner pigs from a supplier who farrows as naturally as we can find. We raise pigs in two ways, depending on the season. Our "spring pigs," which are processed in the fall, are started in our winter paddocks for electric fence training, then move into our back woods. We have 14 acres of woodland forest, so thick in many areas that a human can't even walk through it. We section off segments of this woodland, using temporary electric fencing. One of our Colorado Mountain Dog guardians are assigned to watch over the young pigs when necessary. Throughout their growth period, the pigs make use of their God-given instincts to massage and enrich our land with their work. To ensure the land is not damaged by their work, we regularly move them to a new section of the forest and allow them to start all over. ﻿We supplement their natural, forage diet with lots of raw, wholesome milk and whey from our goats, cooked meat and bones from our kitchen, produce from our gardens and orchards, organic and natural grains, and lots of other wholesome treats. We use a custom-made, organic, non-gmo feed, that uses peas and legumes rather than soy as a base. This means the meat has more Omega-3 acids (the good kind! ), rather than the Omega-6's (the bad kind) caused by common soy-based feeds. Our "fall pigs," which are processed in the spring, spend their early months in our winter paddock. We raise very few pigs over winter, to ensure they have plenty of room to run and root around in the roughly 1/2 acre paddock. They are fed the same diet as our spring pigs, but rather than fresh grass, they receive lots of leafy green alfalfa hay. They also receive a lot more milk and eggs to make up for the lack of foraged protein. While equally healthy, the somewhat different diet gives the spring and fall pork slighty different flavors, both of which are delicious! After the pigs move out of the winter paddock, it is given a full season to rest and replenish itself with lush woodland vegetation and tree nuts, so it is ready for the next set of fall pigs! This type of system not only improves the land and creates AMAZING pork in the end, but it also ensures the pigs are happy and content, physically exercised, mentally challenged, and emotionally satisfied. Just listen to their happy grunts, watch their tails wag, and you can be sure! We are proud that our pork is NOT "the other white meat." In fact, Forest Pork from Red Gate Farm is a dark, rich pink color, because of all the rich nutrition, fresh air, and sunlight the pigs receive. Try some, and you'll be amazed what real pork flavor is all about! For more information on purchasing our pork, click here!